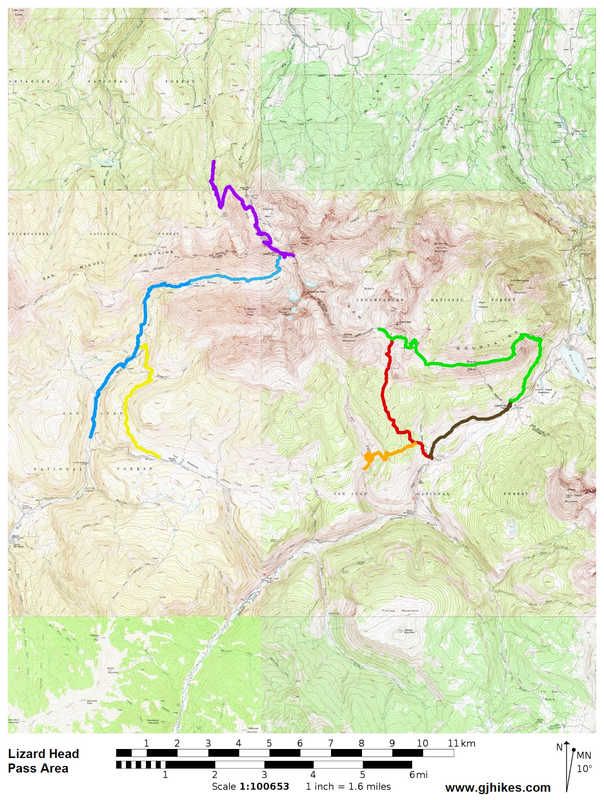 To get to the trailhead drive about 6.5 miles south from Telluride or about the same distance north of Placerville and turn west on the Silver Pick Road. There are signs at most of the intersections to direct your way but basically you bear left after 3.5 miles and at 4 miles bear right onto County Road 59H. Continue for another 2.25 miles, or 6.2 miles from Highway 145, and turn right on FSR 645 where there is a Rock of Ages sign. Continue for another 2.3 miles to the trailhead. The Forest Road isn't maintained for passenger cars but when conditions are ideal they can make it most of the way. We had to park at a campsite a little over a mile from the trailhead and hike from there due to a big mud hole created by a recent thunderstorm. The first part of the trail follows an old mining road. Just over a tenth of a mile from the trailhead the Wilson Mesa trail departs on the right. This part of the trail is open to mountain bikes, horses and dirt bikes but the dirt bikes can only access the trail between July 1st and Labor Day. As the trail continues up the Elk Creek drainage it gains elevation at an easy to hike moderate rate. A series of long sweeping switchbacks begins after the half mile point. At the 1.27 mile point the trail has left the shelter of the forest and begins climbing a talus slope. Next it passes a trail junction where the Elk Creek trail departs on the right. The trail turns back towards the north on a switchback that takes it around the point of the ridge that towers above the trail. 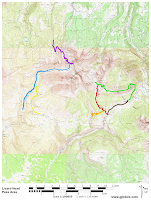 The trail has climbed above the 11,000 foot level by the time it passes the Elk Creek junction. When the trail climbs around the point of the ridge and turns south again it enters the Silver Pick Basin. Eventually the trail will reach the saddle on the far away ridge that is straight ahead at this point. The highest point to the left of the saddle is Wilson Peak (14,016) the goal of most of the people that hike the Rock of Ages trail. Follow the signs and bear right at the 2.2 mile point where the trail shares routes with the Silver Pick Mine road. At the 2.45 mile point the trail crosses into a half mile section of private property where a sign that says 'Humans Only' notifies hikers that no dogs or horses are allowed to cross. The trail leaves the mining road at the 3.2 mile point and begins ascending a very rough talus slope. The talus is constantly shifting as it succumbs to gravity and slips down the mountain. At times some parts of the trail can seem to disappear. We experienced several small rock slides on this trip. Just before the 3.5 mile point the trail passes an old rock house where it has now ascended to almost 12,200 feet. Just past the rock house the trail climbs a nasty section of talus and after leveling off briefly the final route up to the ridge can be seen. 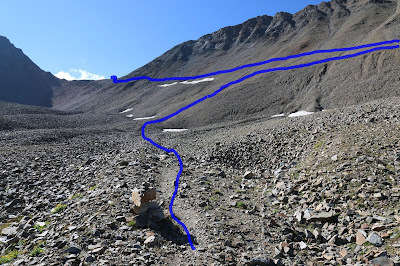 There are a couple of spots where the trail gets very narrow and can be rough dealing with if you are hiking early in the summer when there is still snow on the trail. The trail reaches the ridge at the 4.45 mile point where climbers looking to bag Wilson Peak (14,016) or Gladstone Peak (13,913) will continue climbing the ridge towards the east. Gladstone Peak can be seen on the right of the above picture. At this point the elevation is around 13,054 feet. Some maps indicate that this is the end of the Rock of Ages trail while others have the end of the trail at the 13,319 saddle above Bilk Basin. There isn't a sign to indicate it but once you reach the ridge you are in the Lizard Head Wilderness Area. If you continue up the ridge to the next saddle there are a couple of Class III spots in the trail where you will need to use one or both of your hands to maneuver around the rocky outcrops. Of course, if you are headed to either summit you will have several more sections of Class III to deal with after that. From the next saddle at 13,319 feet to the east on the ridge between Wilson Peak and Gladstone Peak, overlooking Bilk Basin, you can see the final approach to the summit of Wilson Peak which is on the left. The route crosses the same rotten rock that is typical throughout the high ridges of the San Miguel Mountains. The route to Gladstone Peak follows the ridge to the right of the saddle. Higher up and to the right of Gladstone Peak in this photo is Mount Wilson which is normally climbed via a route in Navajo Basin. If you drop down the south side of the 13,054 ridge into the Navajo Basin you can hike down to the Rock of Ages Mine for which the trail was named. This is also the route for climbers looking to bag Mount Wilson and El Diente Peak that tower above the south side of the basin. Backpackers might head down to Navajo Lake where there are several nice camping areas within the shelter of the trees. For us it was the turn around point before heading back to the trailhead. While hiking the Rock of Ages trail another hiker reported seeing a mountain lion going after a pika. Pika, also known as rock rabbits, are very small and would hardly even be a snack for a mountain lion. Given the fact that we had seen a lot of deer down around 10,000 feet it is more likely that the person probably saw a bobcat. Wolverines are sometimes spotted in the area but they are less likely to be mistaken for a wildcat. There aren't any campsites around the Rock of Ages trailhead but there are a half dozen or more along the road driving in. Since camping isn't allowed at the trailhead many people sack out in the back of their vehicles. The last time we were here about 10-15 years ago to climb the 14ers the trail started at a trailhead that was on the private property in Silver Pick Basin. The trail was a lot shorter and there were only 3 or 4 vehicles at the trailhead. Now the route is much longer and there were over a dozen vehicles at the new trailhead and a steady stream of hikers on the trail. Whether you are climbing 14ers, backpacking or just out for a day hike the Rock of Ages trail will give your legs a good workout and lead you to some magnificent views. If you would like to see it for yourself then all you have to do is 'Take a hike'.